Launched in 2011, South Lane is a Scandinavian accessories brand with a focus on an understated yet striking aesthetic. Retaining its avant-garde aesthetic and Scandinavian minimalism, the new AVANT collection refines its roots, combining its artistic Swiss-made craftsmanship and premium Italian leather with industrial edge and luxury feel. The AVANT timepieces are individually treated, resulting in a raw, industrialised and avant-garde detailing where no two pieces are the same. 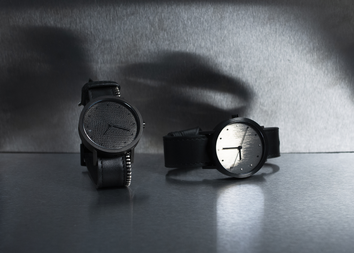 The AVANT timepieces are individually hand-scratched, resulting in a raw, industrialised and avant-garde detailing where no two pieces are the same. Retaining its avant-garde aesthetic and Scandinavian minimalism, the new AVANT collection refines its roots, combining its artistic Swiss-made craftsmanship and premium Italian leather with industrial edge and luxury feel. The designs of the collaboration series drew inspiration from the creatures and the symbols of Greek mythology and the internal fight between light and erevos, flight and fall, life and death and what we call ancient Greek drama.